Successfully Added Sonic Jewelry Cleaner (Desktop Unit) to your Shopping Cart. Sonic jewelry cleaner for gold, silver, antiques as well as for dentures and small tools. Have you had to hire a professional or spend all day cleaning your precious heirlooms or loving gift from your spouse? Then this surprisingly small ultra- sonic cleaner is just the tool you need! Small enough to sit on your tabletop and is powered by simple AA batteries. 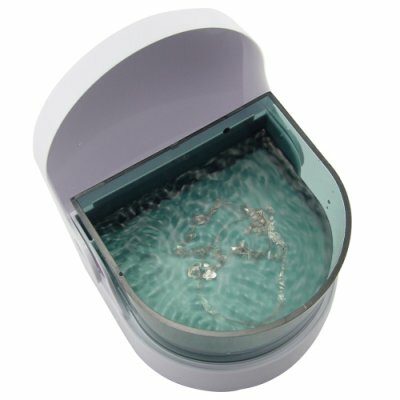 Used to safely clean your jewelry with its incredible advanced ultrasonic cleaning technology, this unit uses sound waves of 5800 vibrations per minute to clean those tight and tough areas which are normally difficult to reach with a brush, and this is all done within a few short minutes. How does it work exactly? Just add water (and possibly a cleaning liquid for more luster), switch the sonic cleaner on and leave it on for a few minutes while it does its work. In a matter of a few minutes you will have cleaner jewelry, antiques, dentures or small tools. Sonic jewelry cleaner, the environmental way to clean all your jewelry within minutes. Can also be used to clean dentures and small tools. Does this jewelry cleaner require cleaning liquid? - No, but you will be much more satisfied with the cleaning results if you use a small amount of soft soap or jewelry specific cleaning solution. Is it loud? - No, the ultrasonic vibration emits only a small buzzing sound which is hardly noticeable. Does it dry the jewelry? - No, after you have cleaned your jewelry you should place it on a clean dry towel or wipe dry with a cloth.